My recent work integrates drawing, painting and contemporary sculptural practices with my interest in biological science and animal studies. 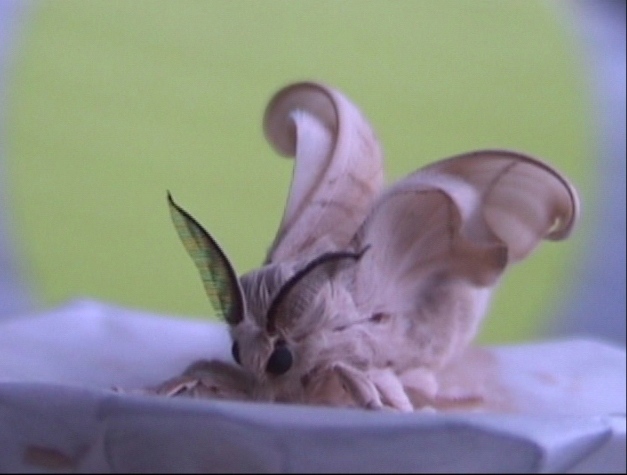 By clicking on "Wings" you will see my inquiry into the behavior of silk moths (Bombyx Mori), which began began when I was rearing and closely observing a large number of these insects. During this process, I noticed with surprise that a few of the moths I raised were able to fly. This behavioral anomaly was startling because for thousands of years, they had been bred not to fly by silk producers throughout Asia. No longer found in the wild, they join the ranks of animal species that thrive in captivity because they have proven to be useful to humans. Encouraged by other contemporary artists who blur line between science and art, my impulse to work with silk moths has become more deliberate. By favoring flight, during the process of selective breeding, I attempt to return them to their wild state. The materials and sculptural forms within this series are associative and can be read on several levels. In Escape Velocity l, the central area of the sculpture subliminally references domestic motifs from suburban recreational pools, dens and patios. Here it serves as an arena for the moths sexual pursuit. Hope and Futility, is comprised of five floral shaped pieces. As artificial symbols of hope, they belie a latent paradox hidden in my ongoing project. Each piece promotes the possibility of flight yet functions as cage. With Kafkaesque humor, this piece re-presents what is problematic in the potential success of the moths. If they regain their ability to fly, where will they go? "Wings and Things" contains recent work done as a response to my experience volunteering as a wildlife rehabilitator at Pacific Wildlife Center in Morro Bay.